Precisely 100 years after the death of Islam’s prophet Muhammad in 632, his Arab followers, after having conquered thousands of miles of lands from Arabia to Spain, found themselves in Gaul, modern day France, facing a hitherto little known people, the Christian Franks. There, around October 10-11, in the year 732, one of history’s most decisive battles took place, demarcating the extent of Islam’s western conquests and ensuring the survival of the West. This famous Tariq anecdote—often reminisced by modern day jihadis—highlights the jihadi nature of the Umayyad caliphate (661-750), the superpower of its day. Indeed, as most historians have acknowledged, the Umayyad caliphate was the “Jihadi-State” par excellence. Its very existence was coterminous with its conquests. Its legitimacy as “viceroy” of Allah was based on subjugating lands in the name of Allah. At any rate, this must have been the picture the men to the north had of the invaders from the south—wild and insatiable madmen, possibly cannibals, mounted on swift steeds, not unlike, in this manner, the Huns of old, who, under the “anti-Christ” figure of Attila, came ravaging through Europe, only to be defeated, in part by the Franks, in the year 451 at the Battle of Chalons, also in modern day France, 150 miles east of Tours. Indeed, unbeknownst to the Muslims, the battle-hardened Frankish ruler Charles, aware of their purport, had begun rallying his liegemen to his standard in an effort to ward off the Islamic drive. Having risen to power in France in 717—the same year a mammoth Muslim army was laying siege to Byzantium—Charles appreciated the significance of the Islamic threat. Accordingly, he intercepted the invaders somewhere between Poitiers and Tours, the latter being the immediate aim of the Muslims. The chroniclers give amazing numbers concerning the Muslims, as many as 300,000. Suffice to say, the Franks were greatly outnumbered, and most historians are content with the figures of 80,000 Muslims against 30,000 Franks. The Muslim force consisted mainly of cavalry, and was geared for offensive warfare. The vast majority being of Berber extraction, they wore little armor, though their elitist Arab overlords were at least chain-mailed. For arms, they relied on the sword and lance; arrows were little used. Conversely, the Franks were primarily an infantry force (except for mounted nobles such as Charles). Relying on deep phalanx-formations and heavy armor—reportedly 70 pounds for each man—the Franks were as immovable as the Muslims were mobile. They also appear to have had a greater variety of weaponry: the shield was ubiquitous, and arms consisted of swords, daggers, javelins, and two kinds of axes, one for wielding and the other for throwing—the francisca. This notorious latter weapon was so symbolic of the Franks that either it was named after them or, quite possibly, they were named after it. The chroniclers state that the two contending armies faced each other for 6-7 days, neither wanting to make the first move. The Franks made much use of the familiar terrain: they appear to have held the high ground; and the dense European woods served not only to provide better shelter but to impede the anticipated Muslim cavalry charge. 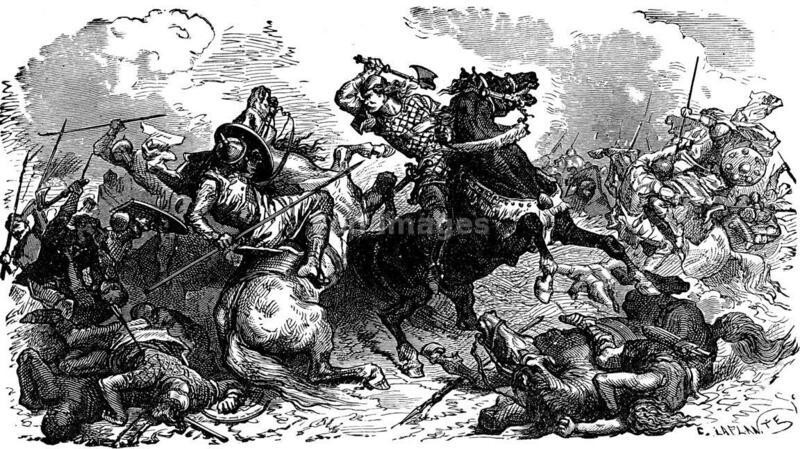 Aside from the fact that this battle ushered in an end to the first massive wave of Islamic conquests, there are some indications that it also precipitated the fall of the Umayyad caliphate, which, as mentioned earlier, owed its very existence to jihad, victory, plunder and slavery (ghanima). In 718, the Umayyads, after investing a considerable amount of manpower and resources trying to conquer Byzantium, the eastern doorway to Europe, lost horribly. Less than fifteen years later, their western attempt was, as seen, also rebuffed at Tours. In the context of these two pivotal defeats, a mere 18 years after Tours, the Umayyad caliphate was overthrown by the Abbasids, and the age of Islam’s great conquests came to an end (until the rise of the Ottoman empire which, like the Umayyads, was also a jihadi state built on territorial conquests, and which did finally conquer Constantinople). Still, some modern armchair historians insist that the Battle of Tours was naught but a “minor skirmish” dedicated to plunder, not conquest. As evidence, they point to the fact that, while early Christian chroniclers highlighted this battle, their Muslim counterparts, (except for the very earliest writers, who did acknowledge it as a disastrous defeat) tended to overlook or minimize its significance—as if that is not to be expected from the defeated, especially their posterity. In fact, when placed in context, the Muslims’ lust for booty only further validates the expansionist jihad thesis (see Majid Khadurri’s Law of War and Peace in Islam which contains an entire chapter on spoils, ghanima, and their central role in the jihad). From the start, the jihadi was guaranteed one of two rewards for his war-efforts: martyrdom if he dies, plunder if he lives. The one an eternal, the other temporal, reward—a win-win situation that, at least according to early Christian and Muslim chroniclers, played a major role in the success of the Muslim conquests. In other words, that the sources indicate the Muslims were booty-hungry, does not in the least negate the fact that, as with all of the initial Muslim conquests, starting with Prophet Muhammad at the Battle of Badr, territorial conquests and the acquisition of booty went hand-in-hand and were the natural culmination of the jihad. At any rate, the facts speak for themselves: after the Battle of Tours, no other massive Muslim invasion would be attempted north of the Pyrenees—until very recently and through very different means.